I have to confess, I am not and have not ever been a big reader. During my turbulent childhood, reading was just not at the top of the list of important things to worry about. Throughout my adulthood, it has proven to be a great failing of mine, and I wish I had learned the love of reading books in my earlier life. So what I am hoping to do here within my blog is to take up reading books in relation to art therapy and creative writing therapy and sharing my thoughts about such books. 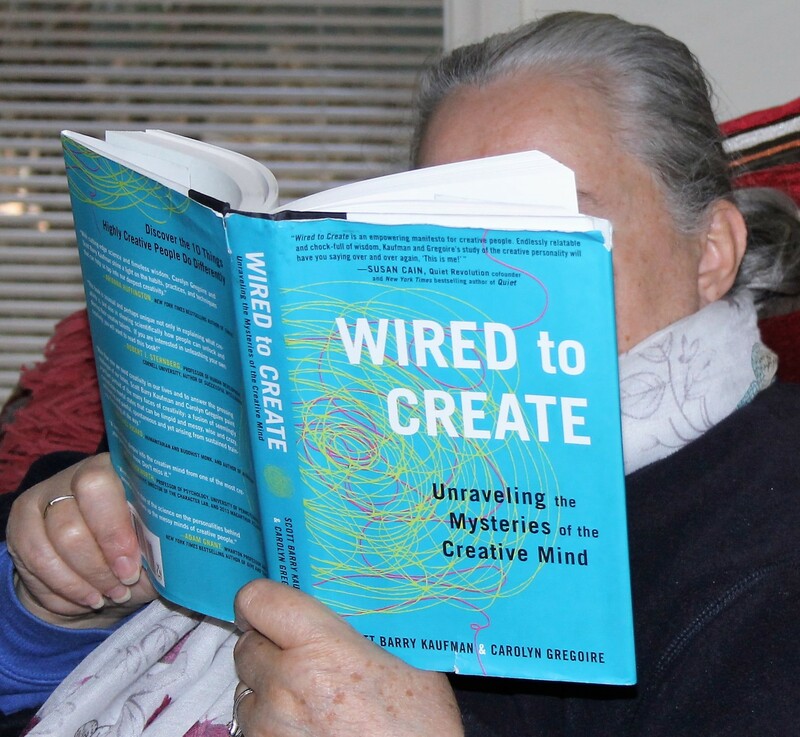 After searching the internet, I came across this book titled Wired to Create. The title captured my imagination firstly, and then it was its – book review and the qualitative authors, psychologist Scott Barry Kaufman and Carolyn Gregoire that final sold me on purchasing the book to read. Scott Barry Kaufman, PhD “is scientific director of the Imagination Institute in the Positive Psychology Center at the University of Pennsylvania, where he investigates the measurement and development of intelligence, imagination, and creativity” (S.B. Kaufman/C. Gregoire 2015). Carolyn Gregoire “is a senior writer at the Huffington Post, where she reports on psychology, mental health, and TEDx and the Harvard Public Health Forum, and has appeared on MSNBC, the Today show, the History Channel, and Huffpost Live” (S.B. Kaufman/C.Gregoire 2015). The Wired to Create book explores the many faces of creativity through the habits and motivations of highly creative people; and what they do differently within areas of: imaginative play, passion, daydreaming, solitude, intuition, openness to experience, mindfulness, sensitivity, turning adversity into advantage, and thinking differently (S.B. Kaufman/C. Gregoire 2015). At first I found Wired to Create a little hard to get into but within a number of pages turned, I was hooked. It was an easy read and I felt myself being able to really grasp what was written. There was much I personally could relate to, along with being able to experience science based new information about a subject matter that’s important to me. Some of the notable things that I learned whilst reading this book, has been that creative people whom enjoy the process of their creativity, and feel a sense of control over it, show greater creativity, than those whom concentrate just on what the end result will accomplish (S.B. Kaufman/C. Gregoire 2015). This statement rings true for myself, as the process of painting, creative writing, photo-taking is very much part of my therapeutic journey overall, and the outcome just seems to be a place where I just stop and pause, in readiness to embark on the next project. Reaching the end of a project is satisfying, but the process in getting there is far more significant and self-fulfilling. Part of this process demonstrates a state of mind describe as ‘flow’ which allows the creative person to be completely absorbed; to be deeply concentrating on the task at hand and in turn, there’s a sensation of time being lost (S.B. Kaufman/C. Gregoire 2015). This flow state of mind has played a very important part during my own art as therapy journey along side of my story telling for each painting I have painted. The subject matter about post-traumatic growth was of great interest to me whilst reading this book. Wired to Create authors stated that “post-traumatic growth often leads people to see new possibilities in their lives, and one of those new possibility ties – may be an artistic hobby or an entirely new career that allows them to express their creativity” (S.B. Kaufman/C. Gregoire 2015). I found this to be true myself as I had taken up art and creative writing at times in my life where I most needed a way of coping with a series of major life crisis’ and traumatic events. Creativity formed an essential part of my post-traumatic growth. It lead me to experiencing a better sense of well-being and improved my life in ways I couldn’t have foreseen. Highly recommend Wired to Create as a read for those interested in what creativity is and how the creative mind works/evolves and how important that we be supportive of those that choose to be creative. That unlocking our creative self, is not just a benefit to ourselves as creators, it also benefits those whom are viewers/users of such creativity. It also benefits humanity at large and the Wired to Create authors help to substantiate that proposition within their book. This entry was posted in Art & Creative Writing as Therapy, Book Reviews by Karen Robinson and tagged Abstract Artist, Art Therapy, Art Therapy Cartoon, Carolyn Gregoire, Creative Conversations, Creative Messy Minds, Creative Writing, ido art karen robinson, Karen Robinson, Mihaly Csikszentmihalyi Flow, Post-Traumatic Growth, Scott Barry Kaufman, Wired to Create by idoartkarenrobinson. Bookmark the permalink. It was a good review, Karen. I appreciate your insight into the book and the links you provided too. It looks like an interesting read. thanks for your review karen. first thing i did after i had finished reading it was log into my amazon account, search for the book then add it to my wishlist ! looking forward to reading it !